The invention and development of the internal-combustion engine in the nineteenth century has had a profound impact on human life. The internal-combustion engine offers a relatively small, lightweight source for the amount of power it produces. Harnessing that power has made possible practical machines ranging from the smallest model airplane to the largest truck. Lawnmowers, chainsaws, and electric generators also may use internal-combustion engines. An important device based on the internal-combustion engine is the automobile. In all internal-combustion engines, however, the basic principles remain the same. Fuel is ignited in a cylinder, or chamber. Inside the sealed, hollow cylinder is a piston (a solid cylinder) that is free to move up and down and is attached at the bottom to a crankshaft. The energy created by the combustion, or burning, of the fuel pushes down on the piston. The movement of the piston turns the crankshaft, which then transfers that movement through various gears to the desired destination, such as the drive wheels in an automobile. The most common internal-combustion engines are the piston-type gasoline engines used in most automobiles. In an engine, the cylinder is housed inside an engine block strong enough to contain the explosions of fuel. Inside the cylinder is a piston that fits the cylinder precisely. Pistons generally are dome-shaped on top, and hollow at the bottom. In a four-stroke engine, the piston completes one up-and-down cycle in four strokes: intake, compression, power, and exhaust. The first stroke, the intake stroke, begins when the piston is at the top of the cylinder, called the cylinder head. As it is drawn down, it creates a vacuum in the cylinder. This is because the piston and the cylinder form an airtight space. This vacuum helps to draw the fuel-air mixture into the cylinder through an open intake valve, which closes when the piston reaches the bottom of the cylinder. On the next stroke, called the compression stroke, the piston is pushed up inside the cylinder, compressing or squeezing the fuel-air mixture into a tighter and tighter space. The compression of the mixture against the top of the cylinder causes the air to heat up, which in turn heats the mixture. Compressing the fuel-air mixture also makes it easier to ignite and makes the resulting explosion more powerful. There is less space for the expanding gases of the explosion to flow, which means they will push harder against the piston in order to escape. At the top of the compression stroke, the fuel-air mixture is ignited by a spark from a spark plug placed in the cylinder head, causing an explosion that pushes the piston down. This stroke is called the power stroke, and this is the stroke that turns the crankshaft. The final stroke, the exhaust stroke, takes the piston upward again, expelling the exhaust gases created by the explosion from the cylinder through an exhaust valve. When the piston reaches the top of the cylinder, it begins the four-step process again. on Carnot's principles, another Frenchman named Jean-Joseph-Étienne Lenoir (1822–1900) presented the world with its first workable internal-combustion engine in 1859. Lenoir's motor was a two-cycle (two-stroke), one-cylinder engine with slide valves that used coal gas as a fuel. A battery supplied the electrical charge to ignite the gas after it was drawn into the cylinder. In 1862, another Frenchman, Alphonse-Eugène Beau de Rochas (1815–1893), designed a four-stroke engine that would overcome many problems associated with the gas engines of that time. Two-stroke engines eliminate the intake and exhaust strokes, combining them with the compression and power strokes. This allows for a lighter, more powerful engine—relative to the engine's size—requiring a less complex design. But the two-stroke cycle is a less efficient method of burning fuel. A residue of unburned fuel remains inside the cylinder, which hinders combustion. The two-stroke engine also ignites its fuel twice as often as a four-stroke engine, which increases the wear on the engine's parts. Two-stroke engines are therefore used mostly where a smaller engine is required, such as on some motorcycles and with small tools. An internal-combustion engine can have anywhere from one to twelve or more cylinders, all acting together in a precisely timed sequence to drive the crankshaft. Automobiles generally have four-, six-, or eight-cylinder engines, although two-cylinder and twelve-cylinder engines are also available. The number of cylinders affects the engine's displacement, that is, the total volume of fuel passed through the cylinders. A larger displacement allows more fuel to be burned, creating more energy to drive the crankshaft. In the case of an engine with two or more cylinders, however, the spark from the spark plugs must be directed to each cylinder in turn. The sequence of firing the cylinders must be timed so that while one piston is in its power stroke, another piston is in its compression stroke. In this way, the force exerted on the crankshaft can be kept constant, allowing the engine to run smoothly. The number of cylinders affects the smoothness of the engine's operation: the more cylinders, the more constant the force on the crankshaft and the more smoothly the engine will run. In addition to piston-driven, gas-powered internal-combustion engines, other internal-combustion engines have been developed, such as the Wankel engine and the gas turbine engine. 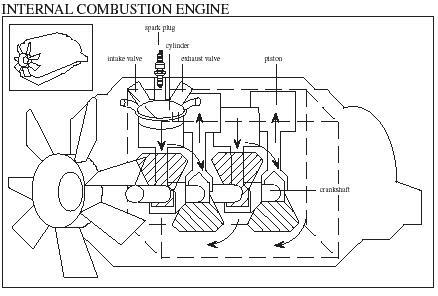 Jet engines and diesel engines are also powered by internal combustion. Thanks for the information on the principles of a four stroke cycle engines. Kindly explain to me how the six and eight cylinder engines work on the four stroke cycle. what are some problems associated with the internal combustion engine? need for help for i.c. engine Problems. Can do you tell me about this.I want to understand about this. While Lenoir invented the first workable internal combustion engine in 1859. Christiaan Huygens was already working on the concept in 1673.
what are the applicatons/uses of the ic engines.. This is so helpful I am using it for an essay I am working on. nice job this site has worked wonders for me tbh and i have been using it a lot for the project i am doing for a class.